Kids & Glitter is this blog where all the art projects I used while volunteering as art teacher at Holy Trinity Elementary, can be found. All are complete, with patterns and directions, and free for you to use. picture and directions for making the projects shown. If you are looking for craft projects using a particular supply, such as craft sticks, paper plates, egg cartons, etc. or a particular subject, such as Lenten crafts, Indian crafts, Christmas, Easter, etc. check out my profile page on HubPages. 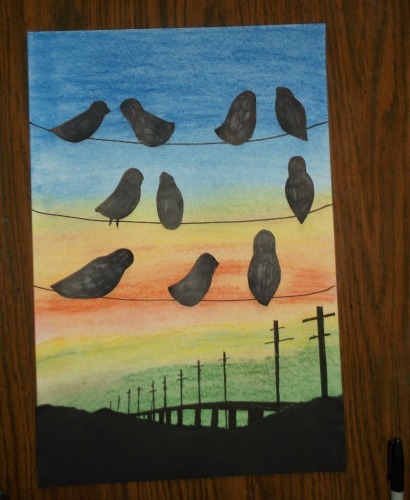 The art project shown above is called “Party Lines” and is found under the 5th Grade Gallery in the sidebar. This entry was posted in Categories and tagged activities for kids, art, art and crafts for kids, arts and crafts, children, classroom art, classroon, crafts, crafts for kids, dancing, dancing penguin feet, elementary, for kids, grade school, kids activities, kids crafts, penguins, winter art. Bookmark the permalink. Thanks so much for listing my squidoo lens: Free Stuff for Teachers to your list. I am sl flattered and appreciative!